The resulting CD blends music of the Old World and the New World. It includes works by classically trained pianists Ernesto Nazareth and Chiquinha Gonzaga, who composed at the end of the 19th century. Their music exhibits the strong influences of Bach and Chopin, both of whom are highly regarded in Brazil. Adding African overtones to the choro and other existing Brazilian styles, these composers produced their own very unique Brazilian sound. 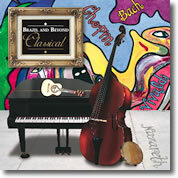 The remainder of the CD features Rich K’s adaptations of works by European classical giants Bach, Chopin and Vivaldi. Bach composed more than a thousand musical works, including cantatas, church music, chorales, sacred songs as well as instrumental works for organ, keyboard and strings. The stature of Bach in Western music reigns supreme. Concerto for Violin in A minor, 1st movement (Allegro): This concerto is clearly in the Venetian style, weaving lyrical phrases between soloist and ensemble. It exemplifies Bach's affection for the works Antonio Vivaldi (the "red priest"). Although his brief artistic life chronologically places him in the Romantic Era, in truth Chopin was steeped in the traditions of the past. He admired Mozart, Beethoven and, above all, J.S. Bach. Yet Chopin's innovations in non-resolving extended harmonies, chromatically curving melodic lines, surprising modulations, and integration of Polish folk music elements places him as one of the most influential and beloved composers of the 19th century. “Choro Chopin”/“Noturno” (hear Choro clip): These adaptations of two of Chopin's works, the B minor waltz and the nocturne in B Major, were originally chamber pieces in 3/4 and 12/8, respectively. They are now in the 2/4 of the Brazilian style of the choro. The lively piano accompaniment is arranged to emulate the contrapuntal style of the seven-string guitar as in a traditional choro ensemble. Chiquinha Gonzaga is considered one of the greatest female musician-composers in the history of Brazilian music. From 1885 she served as conductor of the Tiradentes Theater orchestra and composed music for numerous musicals, burlesques and operettas. The instrumental works of Gonzaga are considered important in the early development of the Brazilian choro. Today the music of Gonzaga has experienced a revival and is popular among choro musicians. “Atrahente” (hear clip): First published in 1877, this polka-choro was composed, according to the composer, during a dream. An early pioneer of choro, Nazareth was trained as a classical pianist in the works of French composers, most importantly in the works of Frédéric Chopin. The Brazilian composer perfected his musical skills as a performer in parlors and theater orchetras alongside Heitor Villa-Lobos. Composing in diverse genres as the polka, waltz and tango, Nazareth created works that have become the cornerstone of Brazilian instrumental music. “Confidências” (hear clip): A hauntingly beautiful waltz evoking many contrasting moods, this piece is reminiscent of the Chopin Waltz in Op. 34, No. 2, and the Larghetto movement in the Polish composer's Piano Concerto No. 2. “Nenê”: This intriguing piece is a spirited dialog between piano, double bass and pandeiro in the style of a tango. “Apanhei-te Cavaquinho!”: This very popular number that is still performed today by choro ensembles, this work is a virtuosic showpiece in the style of a polka-choro. A prolific composer of more than 500 concertos, Vivaldi was an early master of the art of orchestration. He often included in compositions an array of unique instruments such as mandolin, lute, recorder and harpsichord. Concerto for Mandolin, RV93 (hear clip): Written in the 1720s, this concerto was originally composed for soprano lute but today is often performed on mandolin or guitar.